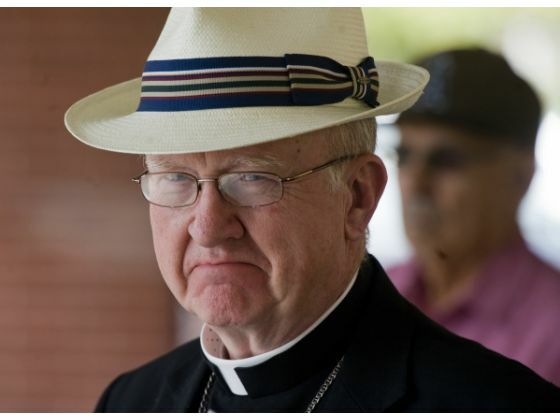 Former Orange priest subject of US Bishops’ “Warning!” OC Bishop stays silent. A priest who worked for six years at Orange’s St. Joseph Hospital has been accused of “improper conduct” in numerous assignments. The conduct was so bad, in fact, that he was “dismissed” from his home diocese and the US Conference of Catholic Bishops issued a warning to dioceses nationwide. What did Orange Bishop Kevin Vann do with this warning? Not much. Same with San Bernardino’s Bishop Gerald Barnes. Fr. Peter Balili worked at Orange’s St. Joseph’s hospital as a part of his studies in “pastoral ministry.” The priest also had assignments in the San Bernardino and San Francisco dioceses. But in 2014, the Diocese of Belleville, IL, DISMISSED him from his duties after they learned of (what they vaguely describe as) “improper conduct.” They also believe that he engaged in this conduct in his other assignments, including California. How did I find out about this? The Diocese of Cleveland actually does as they promise and is transparent about these warnings. If you know about Balili or his conduct while in California, let me know. If I am wrong about Vann’s reaction, let me know that, too. The Diocese of Belleville has advised the Conference of its concerns regarding Fr. Peter Balili a priest of the Diocese of Tagbilaran (Philippines) who had previously served as a fidei donum missionary in the Diocese of Belleville. The Diocese of Belleville informs the Conference that it has dismissed Fr. Balili from this position, and has requested his bishop to direct Fr. Balili to return to his home diocese, and that it took this action based on instances of what the Diocese of Belleville viewed as inappropriate conduct regarding certain of his parishioners. The Diocese of Belleville also indicates that it has learned of similar inappropriate conduct in Fr. Balili’s previous assignments. Those needing further information should contact Fr. Von C. Deeke, liaison for International Priests of the Diocese of Belleville at (618) 277-8181. There are other priests listed as well. You may want to take a gander and ask a few questions. It’s time for the Bishop Quiz! Peter Balili is clearly in hiding. I have found photos and videos of him, but don’t know where he is today. The Warning from the Diocese of Bellville, yes was certainly couched “inappropriate behavior”, we know it was much more than that if they “dismissed Fr. Balili”, even worse THEY urged the priest to flee (they said return) back to his home diocese. Is it not disturbing that they call on ANYONE who wants “further” information to contact the diocese? Well if you read all 3 warnings, all three call on anyone with information to “Contact the diocese for further information” what FURTHER information do they have or are they hiding? Did they immediately inform local authorities? Be sure to read the comments after this story where Father Gallo POSTS his admission to abusing this child, yet he is still a priest according to the Archdiocese of Newark, even though he states he is not. Had he NOT been a priest, then why did the Newark Archdiocese issue the warning to thier own bishops to begin with? Bishops who will, very likely, NEVER come across the path of Fr Manuel Gallo Espinoza, but WHY would they not tell the faithful where he ministered, why would they NOT notify local police? They issued an amazing statement, like I had never seen before IN BOTH SPANISH AND ENGLISH, taking an entire page of a parish bulletin in 1 parish in which he served. When did they do this? Only in March of 2015, even though this warning went out in August of last year and the assault was committed in 2002. Why in March of this year one would wonder? The Archdiocese learned at that point a local newspaper was about to print a story about this priest and a lawsuit was filed against the Archdiocese, a public document. So I hope law enforcement were the very first to call the phone numbers listed at the bottom of each of these warnings, so they could learn more of the “Further information” these three diocese have about these priests, so professionals can investigate and determine, why in fact they were dismissed from ministry and urged to leave this country. The only word that the dear Bishop should be made aware of is “COMEUPPANCE.” Appears like he is long overdue for a case of that comeuppance.